It has been an extraordinarily busy and enjoyable week. I only know what day it is because of a meal during a visit to the Pyewipe Inn. It all started with electrical problems this time. The alternative energy supply works but the engine wont charge the batteries. I spoke to Andy and discussed the situation and by the end of the conversation was no wiser as to what to do to fix it. ‘Can Abz come to visit earlier than planned ‘ I grovelled. So Abz arrived on the Thursday afternoon. While Abz and Mummy went off to spend Daddies money in the shops in Lincoln Andy and I repaired to the hole with an engine in it to check out the wiring. A few hours later we were no further on and by the time of the return of the intrepid shoppers could find nothing amiss. I did find the source of the diesel smell which was a leaking seal on the pump that had been taken out to check the rack moving. I asked Bob if he could get the seal and have a look at the electric side. 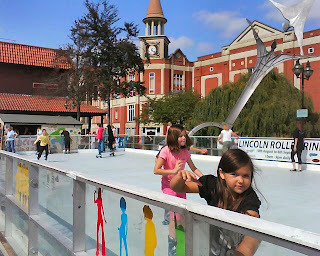 We stayed in Lincoln that night and with the roller rink sitting right in the middle of the city next to the canal it seemed a waste not to use it. This was Abz first go on the roller skates and she was spending more time lying down than standing up. Soon however she was whizzing around and having a whale of a time. This was the second best day in her life I was told when she went to bed. 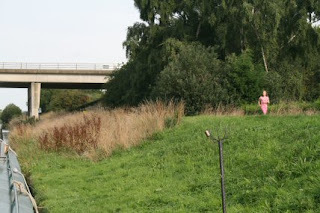 We left the mooring early on Friday and headed for Saxilby to meet up with Bob. On the way I thought there was weed around the prop and pulled in to get at the weed hatch. At this point Abz and I fell out for a short while. 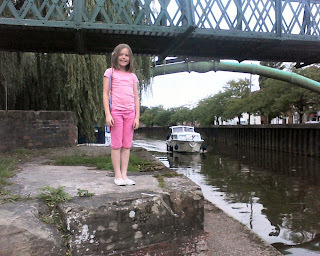 As I had jumped on to the bank to pull the boat in to tie up she walked along the gunwale. She got shouted at to get back in. we were soon friends again when I explained that mummy would not be pleased with me if she was squished between the boat and bank. Bob turned up and with the right gear for the job checked the wiring and the wires that should be carrying current – were and those that shouldn’t – weren’t. After a few more check it turned out that the movement of the engine during the service had disturbed a connection on the batteries and this was soon put right. 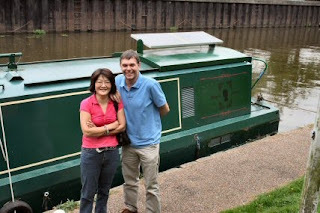 We spent all day at Saxilby and would have moved back to Lincoln for Abz to have another go on the rink but for the fact that the ships cat took shore leave – again. He likes the moorings here and it took a whole tin of tuna for Abz to entice him back on board. He received a days stoppage of leave. Just like defaulters of long ago. It gave Abz time to have a bit of exploring on the mooring. As we left Saxilby there was a load of sirens going off and flashing blue lights. When we had passed under the road bridge we discovered the reason for them. 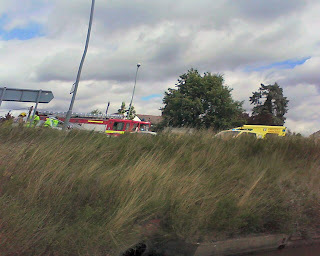 A nasty accident on the road. You don’t get many of those when you are speeding along the canal at 4 mph. Finally moved back to Lincoln and met up with my favourite hitch-hiker who was with her daughter Laurie. Abz was soon encouraging her to go roller skating and delight of delights Abz had a friend on the rink with her. She has the hang of skating now and this time hardly fell at all. We spent Sunday out and about in Lincoln and Abz had her third go at her new hobby. 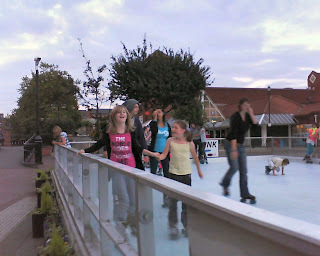 The rink may be a brilliant way of keeping the youngsters busy but it is hardly over used. She isn’t able to go backwards yet but really nips about this time. Soon back on the boat and heading for the Pyewipe for Abz to go home. Things are always cropping up in Lincoln. 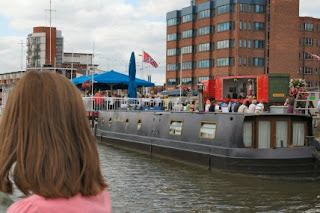 This time we passed the live music being performed outside the Barge restaurant on the Brayford. By the end of the weekends Abz does get just a little tired and will snooze anywhere. The last time she did this it was snowing and the cover was slid shut but the warmth from the engine was just right. Even while she is tired she has surpluse energy and goes of running along the bank at a drop of a hat. The boat becomes a different place entirely once she has left and it is not for the better. While she is here it is in chaos but what chaos. I shall spend some time getting back to normality. This I am finding very hard to do at the moment. I must be getting too old for all this. By Tuesday it is back to Lincoln and getting in the mood for lunch tomorrow. I have had what must be a dozen emails from Syd to remind me of the time and date. Sat in the bows and the mobile goes off. A call from Jude ‘where are you?’ near Stamp End says I. Me too says she. I have decided that one of the best things to do on the canal is to pick up a hitch hiker. You really meet the nicest of people. A very agreeable end to the evening. On Wednesday I am dragged kicking and screaming to lunch at the Pyewipe and “I didn’t want to go”. (you need to be a Max Boyce fan). I arrived early and with in minutes was enjoying the company of a very nice group of people from the Sellwood Group from Horncastle. 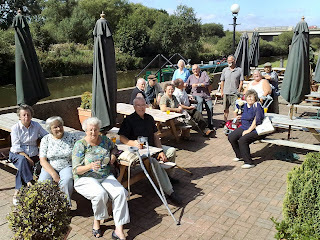 There were 15 of us altogether and sat out enjoying the beautiful day by the canal. The meal was perfect and the vegetables cooked just so. We couldn’t get everyone on the boat for a trip but after a bit of a shuffle we had a number on board and a couple of cars heading for Saxilby. Others will have a trip as we can fix it up. A nice steady chug in brilliant sunshine and a cup of tea thanks to Heidi made for a real chill out trip. We soon arrived and found Syd and Jimmy waiting. What took them ten minutes took us an hour and a half. Stayed the night and got the boat ready for the seal to be fitted and when completed not a drop of diesel leaked off – great. Shortly afterwards Jim and June arrived as they travelled from the Edinburgh Festival to the wedding at Morton. We soon put the world in its place and being thirsty work I was dragged yet again to the pub for a pint. A few hours of delightful company and chat soon went. Niece Emily gets married on Friday. may it be a wonderful day for her.